Meet the France Motorhome Hire dream team! 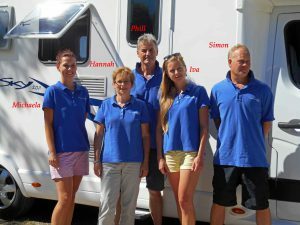 Home > Blog > Meet the France Motorhome Hire dream team! Although motorhome hire is a seasonal business, we don’t believe in seasonal staff so we have a full-time, permanent France Motorhome Hire team. Years in the seasonal travel sector has taught us that if you want to have an experienced, mature, loyal team who can maintain high standards, you must retain them year-round. Rather than a seasonal team who just about get up the learning curve by the end of the season, we choose to start each season with a knowledgeable, professional, English-speaking team who know exactly what to do – all the time. Why does this all matter to you dear reader and prospective client? It means we can deliver immaculate, fully serviced motorhomes, offer great advice to you about your trip, and provide super-duper customer service from initial enquiry, to the very last day of your motorhome or campervan hire. The FMH Team look forward to welcoming you and exceeding your expectations soon!